Sherlock: The Abominable Bride airs on PBS and BBC One, tonight. In advance of this Victorian-era special episode of the Sherlock TV series, PBS has released a new video of the cast and crew choosing which characters they are most like. The “Character Most Like” video features Benedict Cumberbatch, Steven Moffat, Martin Freeman, Amanda Abbington, Sue Vertue, Una Stubbs, and Rupert Graves. The characters Molly Hooper and Mrs. Hudson prove quite popular, which, of course, is elementary. In UK, Sherlock: The Abominable Bride airs on BBC One, at 9:00pm GMT, about 15 minutes from now. In the US, Sherlock the Abominable Bride airs on PBS, at 9:00pm ET/PT, under the MASTERPIECE Mystery! banner. It will also be available online at PBS.org/masterpiece. PBS will air an encore broadcast, Sunday, January 10, at 10:00pm ET/PT. This is the first time that Sherlock has premiered in the US and the UK on the same day. Do you agree with the cast and crew’s character identification? Which character of the Sherlock TV show do you think you’re most like? 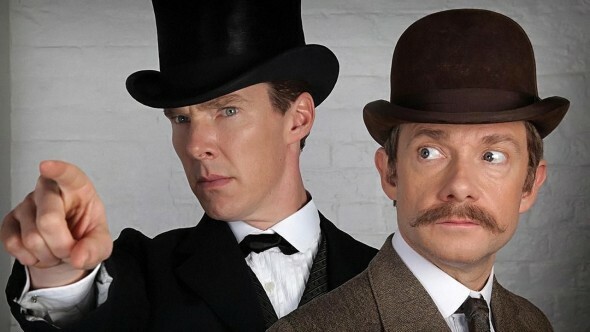 Will you tune in for the Victorian special episode, Sherlock: The Abominable Bride? Tell us. Sherlock: Season Four Shooting Begins; Will it Be the Last?